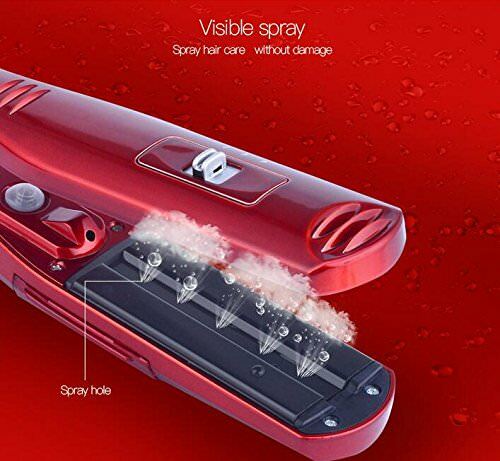 Ultimate Steam Care: Designed with upgraded adjustable steam outlet, PROFESSIONAL HAIR STRAIGHTENER releases steam within 60 seconds’ heating. Conditioning steam infuses moisture back into your hair, locking natural hair oil and adding more shine to the finish. 1-2 drops oil mixed inside achieves extra celestial shine, perfect for silky treatment. Smart Features: High-end rubber matte surface for cozy holding, worldwide dual voltage appliance, removable water tank for easy refills, 60mins auto shut off, 360° swivel salon grade cord and lockable plates for traveling. PLUG TYPE : Ships with correct plug type based on your geographical location.